Operates by electric motor / PTO operated. De husks and splits all pulses with high nutritive value. Special provision for bengal gram (Chana, chickpeas) by emery roll for dehusking and splitting. Cleaning and Grading: This unit consists of a vibratory inclined sieve with hopper. Grain can be collected by discharge chute with good, undersize, oversize grains. The vibratory sieves are providing with different sieve size holes to match the requirements of the type of dal being process. The vibrations are inducing by a cam-operated link, which is mounted on a motor driven shaft. 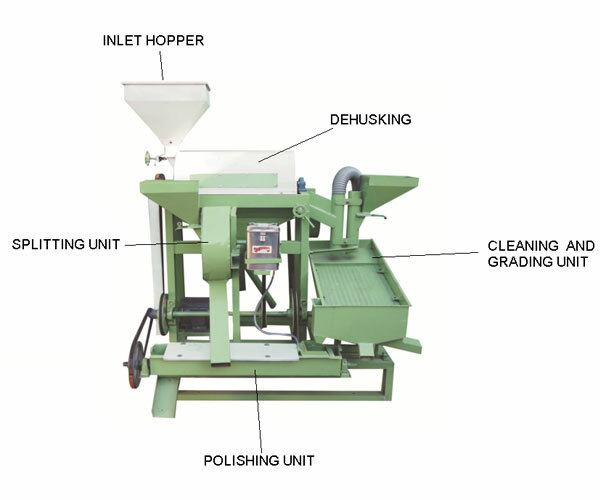 Pitting of Dal: An emery roller machine is used for cracking the husk layer and scratching of clean pulses passing through it. This is done for loosening the husk from sticking to the cotyledons in order to facilitate subsequent oil penetration in the following unit operations. Cracking and scratching of husk takes place mainly by friction between pulses and emery stone. During the operation some of the pulses are dehusked, split and remain whole which can be separated by sieving. De-husking and Splitting of Dal: dehusking of conditioned pulse can be done in emery roll with the help of inlet feeding control valve and outlet control. In one pass about 50-75% of pulses are de husked. splitter can be spilt pulses in two halves. Dehusked split pulses are separated by sieving and the husk is aspirated off. For complete de husking and splitting the whole process is repeated two to three times for maximum recovery. Polisher: Polisher can be use for the conditioning of scratched pulses with the help of oil. This process can be repeated 2-3 time depends upon pulses. Polisher run on common shaft arrangement.